ABS-CBN TV Programs Continue Ruling the Nationwide TV Ratings! The Kapamilya TV programs still lead the nationwide TV ratings! From weekdays to weekends, their shows remain undisputed! The inspirational TV series "100 Days to Heaven" is still the No. 1 Primetime TV series nationwide! Kim Chiu's "My Binondo Girl" now takes the second spot! Meanwhile the newly started mysterious teleserye "Nasaan Ka Elisa" grabs the third place! For weekend, ABS-CBN shows were still on top! The longest running drama anthology "MMK" still tops the Saturday rating while the Judy Ann Santos hosted cooking reality show "Junior Masterchef" is at No. 2! 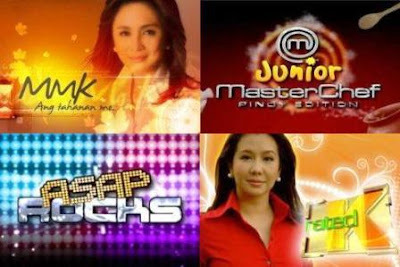 "Rated K" on the other hand and "Pilipinas Got Talent" were the respective first and second placer for Sunday! Wow!